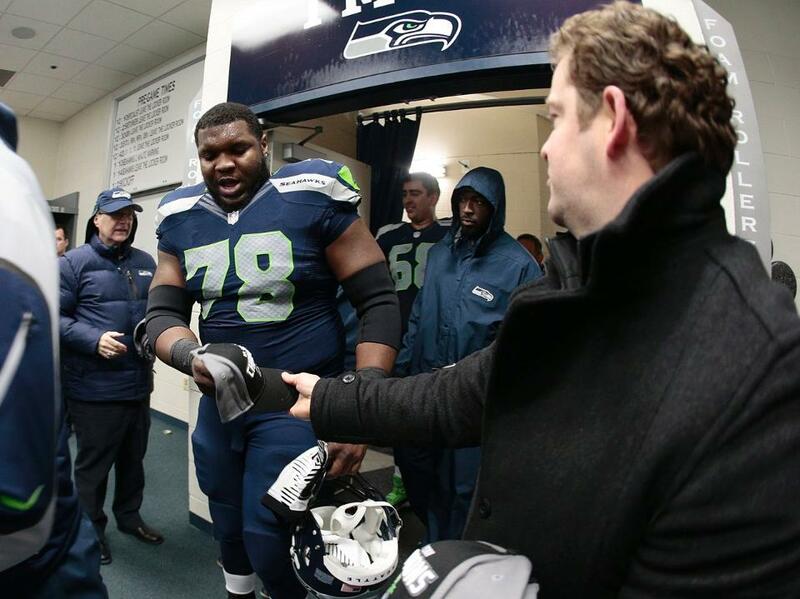 On Sunday, the Seahawks showed that there may have been a hangover following Monday night’s win. The Seahawks fell to the St. Louis Rams 19-13 and in the process the Seahawks fall to 2-2 and are now technically in last place in the NFC West. The Rams improve to 2-2 and take over 3rd place in the division. What may ultimately hurt the most however is that the Seahawks are now 0-2 in divisional play. This game showed great promise early on but those feelings quickly faded, as the Seahawks failed to do many things that are crucial to staying competitive and winning the game. Let’s get to the thoughts I took from this game. We Couldn’t Get Off The Field: The Rams converted 5 third downs today and they all seemed to be at the most crucial of times. The most frustrating conversions were a 14-yard gain on 3rd and 13 in the second quarter. This conversion set up a Greg Zeurlein field goal at the end of the half to give the Rams a 13-7 lead. The second conversion came in the fourth quarter. Sam Bradford completed a 17-yard pass to Austin Pettis on 3rd and 14 which set up Zeurlein’s fourth field goal of the day, which gave the Rams a 19-13 lead. These two stops could have been easily avoided because our secondary gave the Rams receivers too much space to create a play. 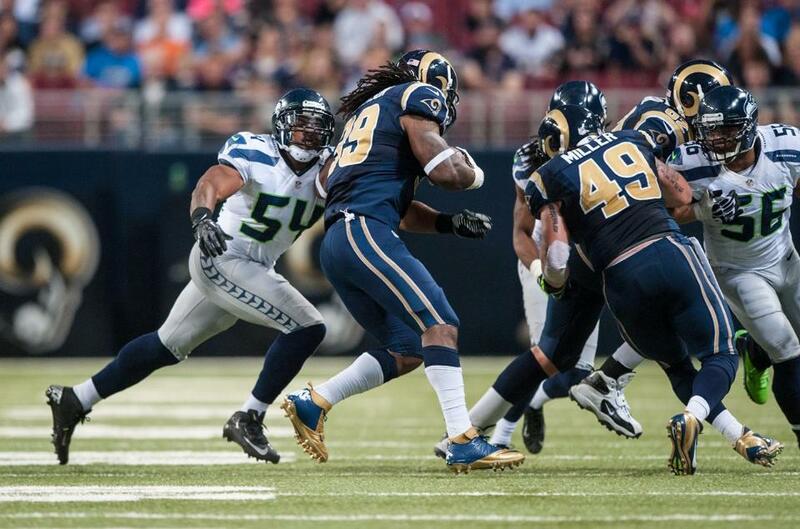 Our run defense was steady throughout most of the game but did give up a couple big runs to Steven Jackson. Overall I am pleased with the defense but unfortunately we could not perform when it mattered the most, which turned out to be the difference in the game. Wilson Needs To Be More Aware: Russell Wilson may be too comfortable in the pocket. Wilson was sacked twice on Sunday, but he was also flushed out of the pocket multiple times and his second interception of the day could have been avoided if he was quicker in deciding where to throw the ball. Wilson also is not taking chances down the field. Mike Martz on the FOX broadcast said that the Seahawks “are almost nonexistent in the 20+ yards per play zone. They thrive in the 10-15 yard range.” Russell threw three interceptions today, although two of them were not his fault. 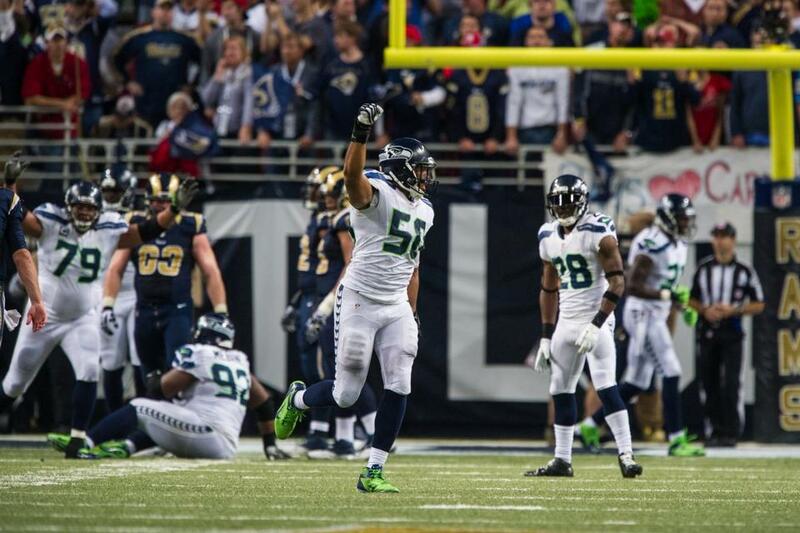 It is getting to the point where I am considering describing the Seahawks offensive as anemic. 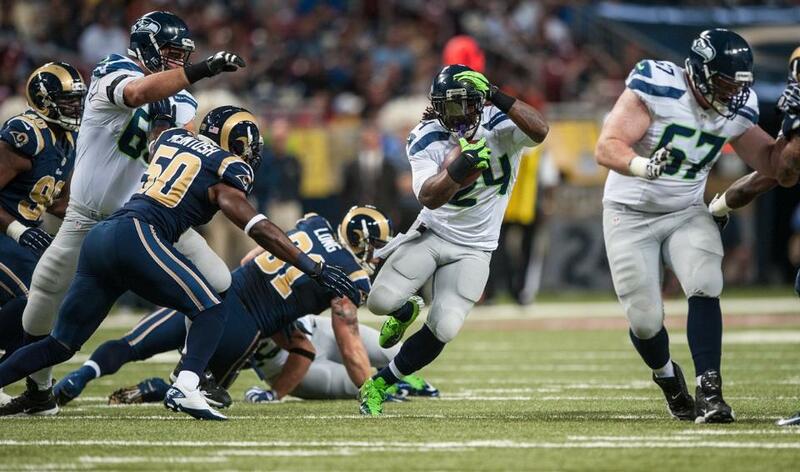 Marshawn Lynch is our offense. We may be in big trouble if Wilson cannot improve his numbers, which of course starts with him processing his decision making and being fully aware of everything going on around him. No, Breno! 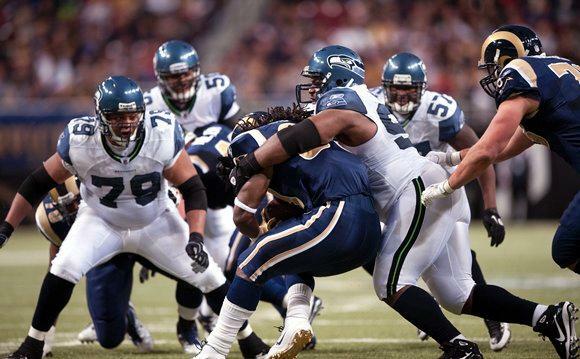 : In my preview post, I explained the importance of Seahawks offensive lineman Breno Giacomini keeping a cool head because Rams cornerback Cortland Finnegan likes to trash talk and get under the skin of opposing players. Despite the importance and concern I had, Giacomini was flagged twice for personal foul penalties. The first of these penalties, as a matter of fact, came as Giacomini shoved Finnegan about five seconds after Marshawn Lynch was tackled and the whistle blew. Watching Breno get out of control has become a serious worry for me. 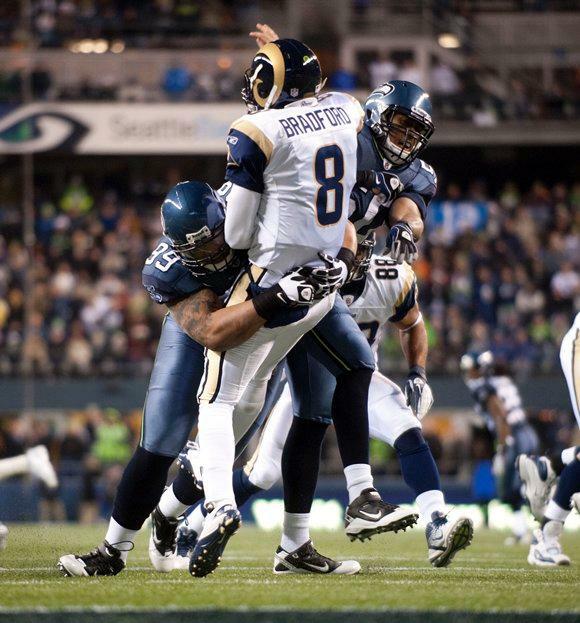 Our opponent clearly knows what to do to tick Giacomini off and the effort to push him to the edge is never-ending. I don’t know what else to say about this except for that Breno needs to seriously take a step back and see how his “heat of the moment” actions are actually hurting his team in the long run. With a very young and talented Carolina Panthers defense up next, Giacomini needs to get a sense of perspective and fast. It’s A Fake! : Pete Carroll claimed in his postgame press conference that he tried to call timeout to prevent the Rams fake field goal touchdown pass to Danny Amendola in the second quarter. Nevertheless, he was unsuccessful in getting the timeout granted and the Seahawks unfortunately gave up 7 points that should never be allowed to happen. What is the most frustrating about this is that Amendola lined up in the huddle and spread out wide to the sideline. None of the Seahawks special teams players noticed Amendola break from the huddle, allowing him to float unguarded for the easy touchdown. These mental mistakes are very uncharacteristic for a special teams unit that has shown to be dominant so far this season. Kudos to the Rams for perfectly executing this play. As a fan it is extremely embarrassing to give up a touchdown as easy as that. I don’t expect any other team to be able to successfully try a trick play like that again this season. If we do give up another trick play I can assure you I will be ripping out chunks of my beautiful red hair. Two Can Play That Game… We Think: What a ballsy call by Coach Carroll by calling an onside kick to start the second half. Hindsight is 20/20 and of course it did not pan out the way we would have hoped but I actually like the play call. The Seahawks entered halftime trailing 13-7 and were faced with the possibility of giving the Rams the ball to start the second half with all of the momentum on their side. Why not take a shot to get the ball back and swing momentum back in our favor? The Seahawks only gave up a field goal on that drive, which is okay considering the excellent field position we gave the Rams. Although I like the call in this situation it doesn’t mean I would like to see it again. Let’s save the onside kicks for when we are trailing at the end of the game. Props To Zuerlein: Rams rookie kicker Greg Zuerlein made four field goals on Sunday, which also tallies to 18 fantasy football points (distances of 58, 48, 60, and 24 respectively). All of his kicks were right down the middle and each had plenty of extra distance. 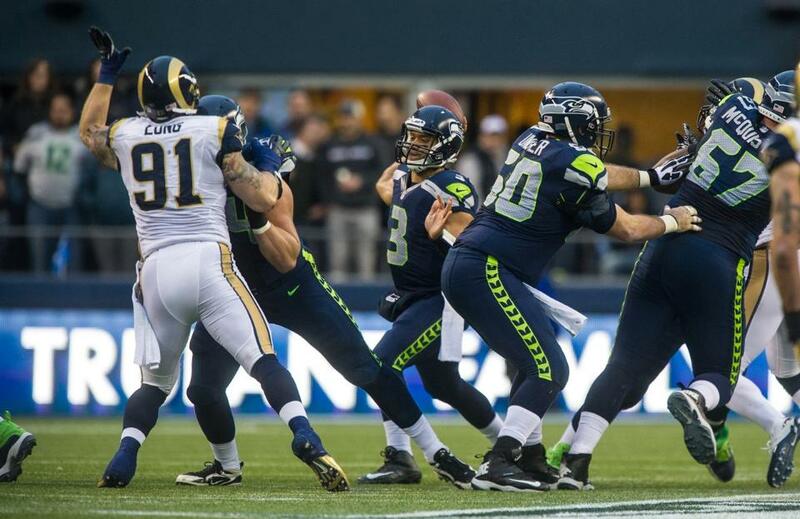 Zuerlein pretty much singlehandedly beat the Seahawks on Sunday. I understand the kicker is not the sexiest position and does not attract the most attention from the media and fans, but St. Louis definitely has a keeper at the position for a long time to come. This guy is definitely proving the Rams made the right choice in releasing Josh Brown during the offseason. Random Thoughts: I had a bowl of cheerios for breakfast. Quite a ways off from the breakfast I was thinking about cooking for me and my roommates… Warren Sapp’s “Bold Prediction” on NFL Gameday Morning today was that the Seahawks would set an all-time NFL record by sacking Sam Bradford 13 times today. We only sacked him twice. I wonder how many more games it will take to get the other 11 sacks to fulfill Sapp’s prediction… Like I was hoping was NOT going to happen, Mike Martz spent most of his commentary time hyping up the Rams… Martz was also quoted during the broadcast saying that “the score doesn’t matter until the fourth quarter. It is 0-0 until the fourth quarter.” Let me test this theory. Hey Mike, if the Rams scored 30 points in quarters 1-3 and the only score in the fourth quarter was a Seahawks touchdown does that mean the Seahawks win the game 7-0?… It was amazing to see how many empty seats there were inside the Edward Jones Dome on television. Granted, the St. Louis Cardinals were playing a very important game at the exact same time right across the street, but still you should be able to drum up more support than what I saw on TV on Sunday. I guess a baseball game with playoff implications is more important to a St. Louis sports fan than a football team that has won 16 games in 6 seasons… The patterns of small attendance for Rams games in St. Louis makes me wonder if the team is going to be at the top of the list of candidates that could move to Los Angeles. The city of Los Angeles just approved a new stadium in the downtown “L.A. Live” area… The game went fast which was nice. I honestly like a fast game especially when it is a 10am kickoff… Mike Carey and his officiating crew did a very good job calling Sunday’s game. I am really happy to see the actual referees back on the field… The Seahawks wore the white jersey/gray pants combination again on Sunday. I would like to see the Seahawks try out the white jersey/blue pants combo again like they did in Denver during the preseason… Although the Seahawks are technically in last place in the NFC West, we are only one game behind San Francisco and two games behind Arizona for the division lead. I am optimistic we can catch up… I lost my fantasy game by 3 points this week. Thanks a lot, Ramses Barden… Hey Rams fans see you in Week 17. We’ll be ready for the rematch no doubt. If I get some free time outside of school this week look for an update or two about what is going on at Seahawks headquarters. If not, look for my preview of next Sunday’s game against the Carolina Panthers most likely on Saturday afternoon. Thanks for reading. Go Seahawks!